We spent over 48 hours researching and testing 20 different kinds of dog carriers and found that design, durability, and convenience were most important. The Sherpa Deluxe dog carrier scored high marks in every category and is our top pick. This stylish carrier is lightweight and looks great too. It has the look of a piece of luggage and meets all commercial airlines carry on specs. It is made from durable nylon and has mesh panels to provide the dog with plenty of air circulation and ventilation. The seat belt strap fits over the handle easily and the faux lambskin lining is comfortable for your pet. Many dog owners are on the go often with work, recreation and just simply day to day life. These top rated dog carriers can make things much easier for a dog owner that takes their pet with them when they travel. These carriers are very popular with customers for many reasons which we will tell you about. Having the right carrier can ensure that your dog will travel in safety and comfort and not arrive at your destination stressed and sick. Whether you are traveling in a car or on a plane, there is a carrier that will work for your needs. If these top rated dog carriers are not what you need, we have provided a detailed buyer’s guide that will give you information on the different types of dog carriers that are available. When you have the right information, choosing the right dog carrier for your needs and preferences becomes much easier. You can be confident that the dog carrier you’ve chosen is going to keep your pet safe and secure while you’re traveling with him/her. Your dog will travel in style in the Sherpa Original Deluxe Carrier. This carrier is stylish and lightweight and looks like a piece of luggage. The design of the Sherpa meets all commercial airlines carry on specifications. It is made of durable quilted nylon with mesh panels so your dog has plenty of ventilation. You can take your dog in and out of it at the top or from the front as well with the top and front entries. The seat belt strap fits right over the upright luggage handle providing further stability for your dog while traveling. The lining is made from a washable faux lambskin that is comfortable for them to lie on. Sherpa deluxe carriers in size small and medium are part of a program called Guaranteed Onboard. This program means that the dog owner is guaranteed to be allowed to take their dog onboard with them on any flight. If they are not allowed because of the carrier, Sherpa will reimburse the customer for the flight and the pet fee. That is a strong guarantee! You can choose from small, medium and large and there are several colors to choose from too including: black, paisley, plum, brown, gray and red. This attractive and comfortable dog carrier fits under most airline seats so you do not have to worry about where you are going to put your dog while traveling. They will be out of the way, right at your feet, safe, secure because they are close to you, and happy. The Petmate Vari Kennel is an Amazon best seller and is designed in the traditional pet carrier style. It is a great way to have your pet travel safely, with plenty of ventilation, durable and safe wire windows that allow the dog to see out and get plenty of air, but not be in danger or poking fingers or escaping. 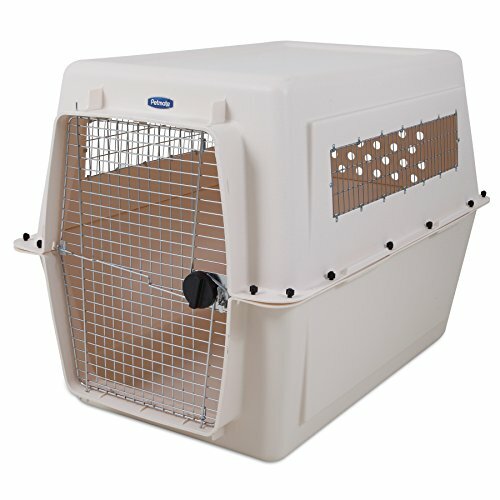 Pets that measure up to 34” tall will fit in this carrier. It is made from 25% recycled products and is long lasting and tough. The heavy duty plastic is easy to clean and the heavy duty fasteners and locking door are all designed to keep your pet safe. This Petmate dog carrier meets all of the USDA and IATA requirements when it comes to shipping live animals. The complete measurements are 48L x 32w x 35h. If you’re looking for a functional, reliable and sturdy dog carrier to house your dog in while you’re traveling, this is a great choice that will meet all of those needs and more. It’s easy to assemble and if it’s not in use, it can be taken apart and the two sides set inside each other for room saving storage. If you have a larger dog, don’t worry about not finding the right carrier. 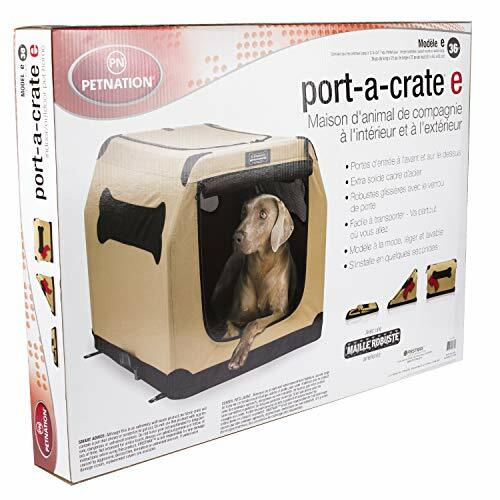 This Petnation Port-a-crate fits dogs up to 70 pounds and provides a perfect on the road home that they will be very comfortable in. The lightweight and durable dog carrier is easily set up or taken down in just seconds and doesn’t require you to need any tools at all. The steel frame that it is made of provides stability that will make your dog feel safe. The frame is covered by a durable, tightly weaved mesh fabric that is a lot stronger than most other crates that are made of fabric. In fact, it is up to 10 times stronger! The round corners prevent any dings and scratches that the carrier can cause by being bumped into walls or the car’s interior. The dog can get into the crate from the top or front; both have zippers as well as locks for the maximum safety and security for your dog during travel. This size dog carrier from Petnation measures 36” x 25” x 25” and is just the right size for golden retrievers, labs, Dalmatians and other mid- sized dogs. It is available in many other sizes to accommodate all breed sizes and types. These top rated dog carriers are exactly what you need to ensure your dog is traveling in style, safety and comfort. Any one of these three is durable, comfortable for your dog and adheres to airline regulations and guidelines. One even has an iron clad guarantee on their small and medium carriers that their dog will be allowed onboard. When you have great products like these to choose from, you can be confident that any one of them will be a great fit for your needs. If none of these top rated dog carriers are what you’re looking for, read our detailed buyer’s guide below that will give you even more information on dog carriers and how to choose the best one that will last. What is a Dog Carrier? A dog carrier is not the same thing as a dog crate, although some dog owners have used carriers for crating purposes if the dog is relatively small. Dog carriers are predominantly used for traveling. Most carriers that are on the market today are designed for and meet airline regulations. Some are able to be brought onboard with the passenger. Other carriers are approved to be in the live cargo area. Airline travel is not easy for any animal so if you have a dog carrier that gives them plenty of security, comfort and ventilation they are going to handle the trip much better. Dog carriers are not just for airline travel. They are very helpful for car traveling or camping as well. Below we have information on how to choose the right dog carrier for your needs. We’ll explain what to look for and how to tell a good carrier from one that is of lesser quality. Once you read this buyer’s guide you’ll be ready to choose the perfect dog carrier for your dog. It’s important to get the right size dog carrier for your dog so they will be comfortable during travel, but a common mistake is to buy too much carrier for the size dog you have. The carrier you choose should allow your dog to lie down comfortably, stand up, raise its head and move around a little. This will ensure that he/she will not be cramped during travel. A cramped, uncomfortable dog is an unhappy and potentially unhealthy one. One of the issues that having too large or a carrier can cause is that it makes it much more difficult to travel on planes, buses or even trains. In addition, if there is too much room in the crate, the dog could think it’s okay to use the bathroom in one corner of the crate since he/she can get away from it on the other side. Ideally you want just enough room to accommodate the dog and that’s it, no extra space. The dog should have enough room in the dog carrier to lie down comfortably, stand up, raise its head, move around, and perform other normal actions. Having space for these movements helps the dog to stay comfortable and relaxed during transit. However, large carriers are more difficult to take on airplanes, on trains, or on buses. In addition, if there is too much space in the carrier, the dog may think that it has enough room to relieve itself in one corner of the carrier. Young dogs or dogs that are nervous are more likely to do this. To prevent this mindset, owners should select a carrier with just enough width, length, and height to accommodate the dog. A good rule of thumb to follow is that the carrier should be about 1 ½ time as long as the dog is when fully grown. If you’re getting a dog carrier for a puppy, you have the choice of getting a carrier to fit them at their puppy size and then get others as they grown or just buy one that will fit his/her size when they are fully grown and separate it off with partitions. When you are shopping for dog carriers, durability and stability are very important for several reasons. Since your dog will be traveling in it, you don’t want it to be made from flimsy materials that don’t feel secure during transit. The more durable and stable your dog carrier is, the less likely it will be that your dog can escape from it, even if they try. It also will provide them with protection in the event that there is any impact with the carrier or jarring from travel. If your dog is traveling with you on an airplane, the dog carrier protects them from getting stepped on, lost or being struck by a suitcase or cart. It also can protect them when you are traveling in a car, in the event of an accident or if the driver has to stop suddenly. What kind of travel will you be doing with your dog, airplane? Vehicle? Train? How long will the dog be required to be in the carrier? Will there be opportunities for the dog to be taken out of the crate to use the bathroom? These are important things to think about when you are looking for that perfect carrier. You want your dog to be safe, secure and comfortable so the carrier you choose will determine that. Make sure it is not likely to tip over or be top heavy and ensure plenty of ventilation; one of the biggest concerns when it comes to a good carrier. Here are some other things to think about and make sure of. The majority of dog owners know ahead of time that they will be traveling with their dog. This gives you plenty of time to choose a good carrier and allow your dog to get used to it before they will be traveling in it. Leave it open in the house with their favorite toys in it, place their food dish outside the front door and feed them close to it. Do things that will let the dog explore it at their leisure and get used to the sight of it. Never force them into it and lock them in. This will not only create distrust, it will flat out frighten them and make the chances of a good travel experience very slim. The longer your dog has to get used to the crate the better off they will be and the more used to it they will be by the time the traveling dates arrive. Another great idea that will help your dog acclimate to the dog carrier is to take them on a few short trips where they are in the carrier so they get used to being in it and then being let out of it. They will be much more comfortable with it by allowing them the chance to get used to it and not fear it. One of the most important factors you need to look for in a dog carrier is plenty of ventilation. Wire windows, screens, and slots are just a few of the ways that adequate ventilation is provided for your dog. The idea is for air to flow freely through the carrier so the dog does not become overheated. It is also a good way for them to be able to see what is going on around them and this can alleviate some of their worries. Spring Loaded Doors…Good or Bad? You may think that having a spring loaded door is a good idea, but these can actually pop open unexpectedly as well as slam shut on the dog’s tail or paw. Look for locks that are strong and durable and that secure firmly are the objective. Metal latches are going to be the most durable, and as long as it is not spring loaded, you shouldn’t have any trouble with it. If you travel a lot with your dog, you may want to look for the dog carrier models that have wheels. Some even have extendable handles much like the wheeled luggage that is available nowadays. A dog carrier with wheels makes taking the dog through airports much easier and faster. It’s also a lot nicer on your back and shoulder since carrying a dog carrier through an airport can be really tiring. It will also make taking the dog to the bathroom much faster and easier as well too. The safety and comfort of your dog is very important. Choosing the right dog carrier will be a crucial factor in how well they travel. 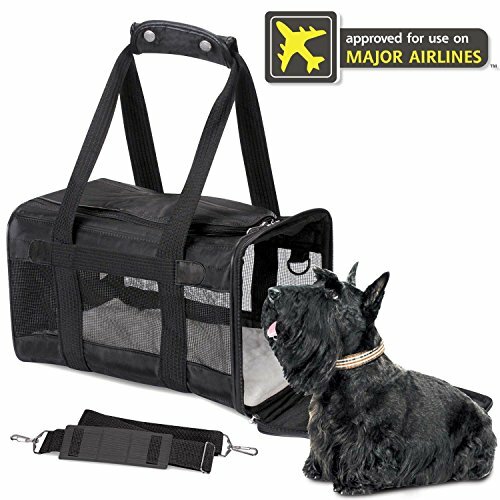 If you take the time to choose a dog carrier that is the right size for them, that is durable and strong, has plenty of ventilation and is approved to be used on airlines and trains as well as in your own vehicle, they will learn not to be afraid of traveling and will actually come to really love it. The information you have learned in this buyer’s guide can help make your choice much easier when it comes time to buy your dog carrier.